Shippensburg had a lot of trouble against Harrisburg's pressure defense in a Mid Penn semifinal defeat. NEWVILLE - The Shippensburg Greyhounds came into their Mid Penn Conference boys semifinal game Wednesday night at Big Spring hoping to capitalize on the opportunity to play a strong and finally healthy Harrisburg Cougars team. However, it was the Cougars who took advantage of some errant passing and lax defense to gain a large lead on the Hounds early in the game and coast to an easy win, 76-35. Shippensburg made its first basket, a wide open 3-pointer by Carter Van Scyoc, and then the Cougars went to work. 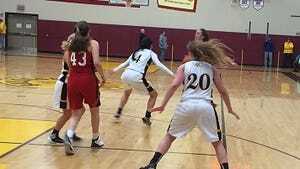 Harrisburg went on a quick 19-0 run aided by multiple Greyhound turnovers. Ship (16-7) was crippled by Harrisburg’s full-court press and half-court trap, which led to countless easy baskets for the Cougars (17-4). The length and athleticism of Harrisburg clogged up the passing lanes and made it difficult for the Hounds to advance the ball past half court. “I expected them to pressure us right from the start when I saw who they were starting, and we didn’t handle it well at all," Shippensburg coach Ray Staver said. "The best possession of the game for us was that first possession where we got the open three and slowed the pace. The run-and-gun style of Harrisburg's offense also gave Shippensburg trouble - the Greyhounds could not get their defense set up fast enough to keep the Cougars' big men out of the paint. Senior Anthony Johnson, the Cougars' leading scorer, had his way with the Hounds throughout the game and scored 19 points. After picking up two early fouls and sitting for most of the second quarter, he came back in the third to score nine points in very little time. “Anthony is a good player. As long as he’s going to the rim like he has been, we’re a good team,” Harrisburg coach Kirk Smallwood said. Johnson’s counterpart in the front court, Elijah Barrett, also had a strong game in the paint. Barrett finished with 13 points, many of which came off of put-backs and tip-ins off his teammates’ missed shots. The game wasn’t completely negative for the Greyhounds, who play Friday in the first round of District 3 Class AAA playoffs at home against Red Lion. The loss showed some of the holes in the team’s play and gave them an idea of what they need to improve on before their next game. Notes: Shuntan Hickman led the Greyhounds in scoring with nine points and Van Scyoc finished with eight ... The loss broke an eight-game win streak for Ship. Anthony Johnson 9-11 1-5 19, Elijah Barrett 6-13 1-2 13, Tony James 6-8 0-0 12, Quentin Flemister 4-9 0-0 10, Shaquon Anderson-Butts 3-5 0-0 7, Jabari Tate 2-4 0-0 5, Simon Esayas 2-4 0-1 4, Damion Barber 1-1 0-0 2, Naasir Johnson 1-3 0-0 2, Na’Reece Glenn 0-2 2-2 2. Totals — 34-60 4-10 76. Shuntan Hickman 3-7 1-2 9, Carter Van Scyoc 3-8 1-2 8, Wade Mills 2-5 0-0 4, Teagan Staver 2-4 0-0 4, Cody Gustafson 1-3 0-0 2, Alaric Hickman 1-2 0-0 2, Adam Houser 0-2 2-2 2, Brady Kuhn 1-2 0-0 2, Clayton Stine 1-3 0-0 2. Totals — 14 4-8 35. 3-point goals — Harr 4 (Flemister 2, Anderson-Butts, Tate), Ship 3 (Hickman 2, Van Scyoc).